New York – Archbishop Demetrios of America who travelled to Athens last week to attend and participate in the International Conference on Religious and Cultural Pluralism and Peaceful Coexistence in the Middle East, organized by the Ministry of Foreign Affairs of Greece, had important meeting with the Greek leadership and religious leaders. Archbishop Demetrios met on October 21 with the President of the Hellenic Republic, Prokopis Pavlopoulos, Prime Minister Alexis Tsipras and His Beatitude Archbishop Ieronymos of Athens and All Greece. President Prokopis Pavlopoulos welcomed the Archbishop at the Presidential Palace and during their meeting thanked His Eminence and the Greek Orthodox Church in America for the active and substantial support to the homeland throughout the duration of the economic crisis in Greece, especially during the recent critical period of negotiations with the European Union. “You have done a lot and you did it from the heart,” said Mr. Pavlopoulos. Archbishop Demetrios visited Prime Minister Alexis Tsipras at the Maximou Mansion and congratulated him for organizing the International Conference on the peaceful coexistence of the peoples in the Middle East. Mr. Tsipras thanked the Archbishop for his participation and noted that the great number of religious leaders who took part in the Conference serves as the example for mutual understanding and cooperation, especially in conditions where the exploitation of religious faith fosters discord and brings conflicts. Later in the afternoon, Archbishop Demetrios together with Archbishop Ieronymos of Athens and All Greece visited the Demetreion (Δημήτρειον) Center for Creative Activity and Care of Children in Moshato, which has been named in honor of Archbishop Demetrios, was established and operates under the supervision of the Philanthropic organization Apostoli of the Archdiocese of Athens. During the visit, Archbishop Ieronymos awarded to Archbishop Demetrios the medal of St. Dionysios Areopagite, which is the highest honor of the Archdiocese of Athens. The two hierarchs shared a meal with the children of the institution and witnessed up close the work that is being done for the care and support of children aged 6-12 years from low income families or families facing other social problems. Archbishop Ieronymos of Athens and All Greece was accompanied by the Metropolitan Gavril of Nea Ionia and Philadelphia and the director of Apostoli Mr. Konstantinos Dimtsas. His Eminence Archbishop Demetrios of America participated in the proceedings of the international conference titled Religious and Cultural Pluralism and Peaceful Coexistence in the Middle East, organized by the Ministry of Foreign Affairs of Greece, October 18-20, 2015, in Athens. In his address, Archbishop Demetrios, emphasized the aspect of humanitarian aid in response to the crisis that flared up in the Middle East and spreads in Europe and around the world. He highlighted the contribution and role of IOCC (International Orthodox Christian Charities), which is the official humanitarian agency of the Assembly Canonical Orthodox Bishops in the United States. (see full text below). His Eminence said the initiative of the Greek Government and the Ministry of Foreign Affairs in organizing the international conference was very important and an opportunity for understanding and conciliation in a terribly difficult landscape. 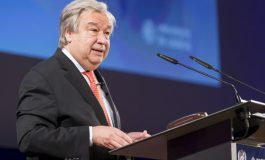 He noted that the presence and participation of the Primates of the Orthodox Churches led by Ecumenical Patriarch Bartholomew and the participation of other leaders and key personalities from the Middle East region indicates the degree of urgency for action and gives us hope for immediate and effective response. “The Christian element is diminishing in the area and this is a disturbing development,” Archbishop Demetrios said in another statement and, noting the drastic reduction of the Orthodox population in the Middle East in recent years, emphasized the need for measures to prevent and avert the long-term consequences of conflict and demographic and cultural changes in the region. When invited to gather with brothers and sisters, friends and colleagues from around the world to celebrate a joyous occasion, I am certain that all of us would very much welcome such an opportunity. Our present meeting, however, is brought about by an ongoing crisis in the Middle East and a sense of urgency to respond to the huge humanitarian crisis. The Middle East, a distinguished georgraphical area of religious and cultural pluralism for at least 4000 years has unfortunately experienced unprecedented levels of violence for a number of decades. This fertile land, which has served as the cradle of so many civilizations, is being poisoned by fear, hatred, and violence. The tragic result of such conditions has been the mass extinction of local communities that have peacefully coexisted with their neighbors for centuries. Whereas in the past it was not uncommon to find villages, town and cities comprised of people of various religious beliefs and cultural traditions, today people are being taught to view their neighbor with suspicion. Those who refuse to change their way of life are persecuted, executed, or forcefully evicted from their homeland. These conditions have now ushered in a fractured image of the Middle East, one where people are forced to exist within prescribed borders that define one’s identity according to differences rather than according to the plethora of principles held in common for generations. The reality of the pluralism that the Middle East has exemplified for generations, has been transformed into a chaos and even to the destruction of global heritage sites whose importance has been recognized by the entire world. What we have in front of us, therefore, is nothing short of a humanitarian crisis of unprecedented proportions. There are some who call the conditions on the ground genocide. Allow me to say, however, that this genocide does not discriminate only against a particular religious group since we know that people of all faiths are being persecuted. Perhaps, in addition to acknowledging this crisis as genocide, we might best define it as memorycide, that is, the massive erasure of the history of local communities from the collective memory of the world. Of course, we can blame the media and external forces for projecting a distorted vision of the Middle East, one which presents the region as the historical land of a particular religious community alone. However, we must ask ourselves how much we have invested in educating our own communities; how much we have engaged partners of other religious convictions that are prepared to paint an authentic image of the region the way it has been for more than 4000 years. We are certain that the Middle-East crisis will not be solved with more bombs and mortars. Diplomacy and extended sincere dialogs are useful tools. However, when viewed in isolation, diplomacy’s effectiveness is quite limited. What we know is that a humanitarian crisis can be effectively handled mostly through humanitarian relief. Please allow me at this point to offer a specific example. I am referring to IOCC, the International Orthodox Christian Charities, which is the official humanitarian agency of the Assembly of Canonical Orthodox Bishops of the United States. IOCC has provided humanitarian relief to 3.1 million Syrian people displaced in their own country or living as refugees in Jordan, Lebanon, Iraq and Armenia. By building capacity and trust in the region, the IOCC has distributed over $50 million dollars worth of aid to address the humanitarian crisis in Syria. Through careful planning and responsible distribution of these funds, the IOCC has provided internally displaced Syrians and refugees with distributions of food, clothing, hygiene kits, bedding, cooking supplies as well as providing maternal and infant health, emergency nutrition assistance, psychosocial support, education support, shelter rehabilitation and repair, and it has also worked hard to reduce public health risks. Most importantly, the IOCC has administered its humanitarian relief projects without discriminating against one’s ethnicity, race, gender or religion. This has helped bring members of conflicting communities back together. Together with the Department of Ecumenical Relations of the Greek Orthodox Patriarchate of Antioch and by the grace of God, the humanitarian work of IOCC represents a tangible example of how our efforts can be effective in dealing with the crisis. It also helps bring to mind once again the fact that the Middle East is the land with a superb history of cultural and religious pluralism. An exceedingly precious pluralism that has to stay there forever. Next article Hollande to Tsipras: "I've Got Your Back"